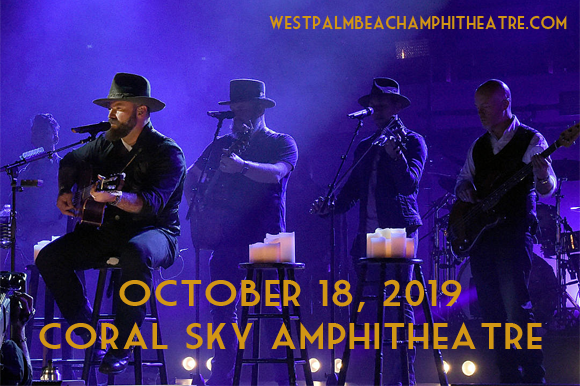 One of the hardest-working groups in music, Zac Brown Band comes to Coral Sky Amphitheatre on Saturday 19th October 2019 for the second night in a row! The band will be performing as part of the Owl Tour, their third consecutive 2019 tour, and for this incredible show they've got brand new material waiting in the wings! ZBB will be supported by "cosmic country soul rock band" Lukas Nelson & Promise of the Real! Led by frontman, singer, guitarist and songwriter Zac Brown, Zac Brown Band was formed in Dahlonega, Georgia in 2002. Brown had been regularly touring since the age of 19, and over time had bought himself a tour bus, which led to the official formation of Zac Brown Band. As time went on, he continued to tour extensively, and the band gained more and more members. Today, the group consists of Zac Brown (lead vocals, guitar), Jimmy De Martini (fiddle, vocals), John Driskell Hopkins (bass guitar, guitar, baritone guitar, banjo, ukulele, upright bass, vocals), Coy Bowles (guitar, keyboards), Chris Fryar (drums), Clay Cook (guitar, keyboards, mandolin, steel guitar, vocals), Matt Mangano (bass guitar), and Daniel de los Reyes (percussion). The group's debut album, The Foundation, was released in 2008 and has been certified triple-platinum by the RIAA. To date, Zac Brown Band has released five major-label studio albums, and has won three Grammy Awards from nine nominations.